Celebrate the work of young amateur South African filmmakers at the fifth annual LivingIt Ubuntu Youth Film Festival, during the US Woordfees at Oude Libertas Arts and Culture Centre in Stellenbosch, on Sunday 13 March 2016 from 3pm to 9pm. Entry is free. The festival will screen a series of short five-minute films produced by amateur youth and the top five competition entries will be announced. While viewing the films, attendees will be invited to write notes about personal growth, change, or their feelings about South Africa‘s progress (or lack thereof) and insert them into a wire phoenix with flapping wings and a 3 meter wingspan. The work of young amateur South African filmmakers will be publicly celebrated at the fifth annual LivingIt Ubuntu Youth Film Festival, taking place at the US Woordfees at Oude Libertas Arts and Culture Centre in Stellenbosch, on Sunday 13 March 2016, from 3pm to 9pm. The festival, which was made possible by a grant from the National Lotteries Commission (NLC), will screen a series of short five-minute films produced by amateur youth. Besides its mission of ‘ubuntu’ – bringing people together – the festival has a legacy of fostering talent, with works on YouTube, and seen on local television and screens as far afield as Boston, Toronto, Edinburgh and London. Some of its winners, such as Kobus Potgieter, have gone on to become filmmakers. Selected works have also been screened at the Cape Winelands Film Festival and regularly on Cape Town TV, posted on the JIP Die Burger, Volksblad and Beeld website, loaded onto YouTube and Facebook and have been sent around the globe by the Global Oneness Project. LivingIt is a non-profit organisation with an impressive track record of success in giving voice to the hopes and dreams of young people in South Africa. Programme activities challenge, inspire, support and train young South Africans to produce short films of under five minutes. This year’s Festival theme is Ubuntu (stay/happy/bly/hlala/onwabile). With the assistance of skilled professionals, these films are generated entirely by the young people, from script writing, acting and shooting the film, to final editing. In this way the participants are provided with a wide range of skills and opportunities while using film as a vehicle to voice the hopes and dreams of youngsters, for a united world. The top five competition entries will be announced at the Festival and each of these will receive R6 000, part sponsored by the ATKV (Afrikaanse Taal en Kultuurvereniging). Further prizes will be awarded at an Artscape screening in August. While the films are running, attendees will be invited to write notes about personal growth, change, or their feelings about South Africa’s progress (or lack thereof) and insert them into a wire phoenix with flapping wings and a 3m wingspan. The evening’s climax will be a fire ceremony complete with dancers, when the phoenix is set alight. Teens who take part in LivingIt’s programme and who show a talent in the various aspects of filmmaking (from pre-production to script-writing to acting) are linked to national and international educational institutions where they can further their education to become employable within South Africa’s film industry. Two one-day introductory workshops were held in Cape Town in December 2015 to guide and assist aspirant young film makers in getting started. In addition, a one-day workshop at City Varsity film school was made available in January to the first five individuals or groups who appealed for final tweaking and assistance of their entries at City Varsity film school. A pre-screening of the film entries along with short films from other organisations that work with young people and children making their own movies, will be shown on 9 March 2016 at 15h30 in the Neelsie, Stellenbosch University. A permanent interactive art installation, Afrigamibirds, inspired by the Japanese tradition of seeking to make a wish come true by folding 1000 paper cranes, will also be on display at the Oude Libertas Art Gallery. This installation reflects the wishes of diverse communities for a peaceful and compassionate society that lives in harmony with the earth. Entry to both the Film Festival, pre-screening and art installation is free. With all the elements for a fun and meaningful family outing, other festival activities include interactive origami stalls, hula hooping, workshops, competitions, crafts and food stalls with picnic facilities available. Heads up, South Africa! 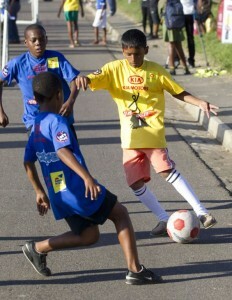 Two years after the FIFA World Cup, soccer is still alive and kicking on the streets around the country, as the annual Kia Street Soccer league launches in May. This year, for the first time, provincial winners from each region will be flown to Johannesburg to compete for the title of National Street Soccer Champion, in a grand display of how all roads lead to soccer success. Sporting Chance, in association with title sponsor KIA and associate sponsors Foodzone, Dawn Wing, Mille and Supersport Let’s Play, will roll out the national neighbourhood street soccer programme that will reach approximately 6000 boys and girls under the age of 13, empowering and exposing them to a brighter future through the valuable lessons of sport. Already well established in Gauteng, Western Cape, KZN and Eastern Cape, the KIA Street Soccer programme is the largest of its kind. Its great success last year has propelled it into a new province in 2012, with incorporation of the Free State. With many rural communities keen to participate in the programme, the inclusion of the Free State is a big step towards making street soccer available to all South African youth, whether urban or rural-based. 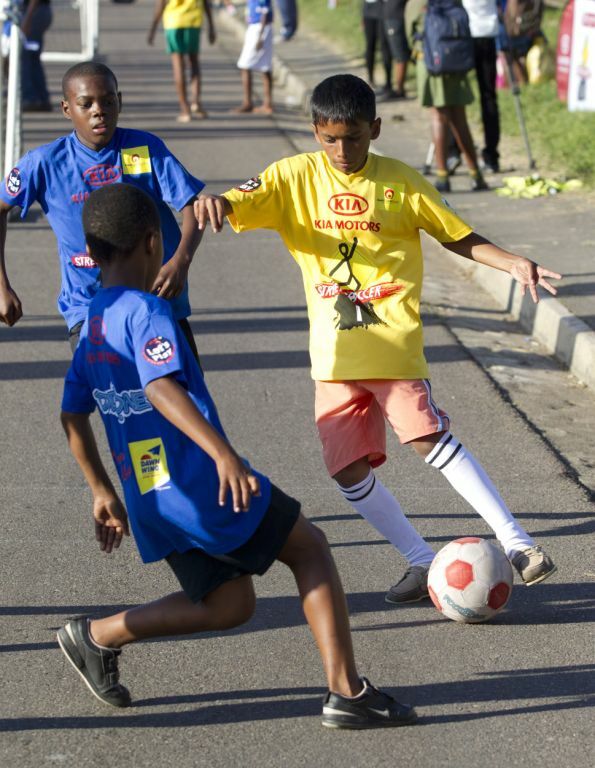 Conceptualised and co-ordinated by youth sports development agency Sporting Chance, the Kia Street Soccer Programme, supported by FIFA and SAFA, teaches life skills through the game of soccer, to kids who need it most, where they need it most. Their communities in the 40 regions are hindered by poverty and crime, and lack in adequate and safe facilities or stimulating after-school and weekend activities. Italians chew parsley, Iraqis stick a clove between their teeth, Indians use fennel seeds and most people believe in the fresh breath restoring powers of mint. But according to the world’s leading oral malodour expert Dr Mel Rosenberg, the most important thing you can do to keep your breath fresh is practice good oral hygiene. Dr Rosenberg, a Professor of Microbiology at Tel Aviv University, has worked on the diagnosis and treatment of bad breath for over twenty years. He was in South Africa for National Dentyl pH Fresh Breath Week (3 to 10 February) to help bring this embarrassing problem ‘out of the closet’ and share his expertise with local dental professionals.